U. TEXAS-AUSTIN (US) — An inexpensive antifungal drug slows tumor growth and shows promise as a chemotherapy for cancer, new research shows. Scientists made the discovery with thiabendazole by exploiting the evolutionary relatedness of yeast, frogs, mice, and humans. Thiabendazole—an FDA-approved, generic drug taken orally that has been in clinical use for 40 years as an antifungal—is not currently used for cancer therapy. As reported in the journal PLoS Biology, the drug works by destroying newly-established blood vessels, making it a “vascular disrupting agent.” Inhibiting blood vessel, or vascular, growth can be an important chemotherapeutic tool because it starves tumors. Tumors induce new blood vessel formation to feed their out-of-control growth. In trials using mice, the researchers found that thiabendazole decreased blood vessel growth in fibrosarcoma tumors by more than a half. Fibrosarcomas are cancers of the connective tissue, and they are generally heavily vascularized with blood vessels. The drug also slowed tumor growth. In a previous study, Marcotte and his colleagues found genes in single-celled yeast that are shared with vertebrates by virtue of their shared evolutionary history. In yeasts, which have no blood vessels, the genes are responsible for responding to various stresses to the cells. In vertebrates, the genes have been repurposed to regulate vein and artery growth, or angiogenesis. “We reasoned that by analyzing this particular set of genes, we might be able to identify drugs that target the yeast pathway that also act as angiogenesis inhibitors suitable for chemotherapy,” Marcotte says. Turns out they were right. Hye Ji Cha, a graduate student in cell and molecular biology searched for a molecule that would inhibit the action of those yeast genes. She found that thiabendazole did the trick. She then tested the drug in developing frog embryos. 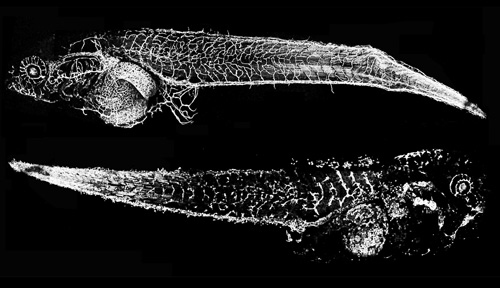 These are fast growing vertebrates in which scientists can watch blood vessel growth in living animals. Frog embryos grown in water with the drug either didn’t grow blood vessels or grew blood vessels that were then dissolved away by the drug. Interestingly, when the drug was removed, the embryos’ blood vessels grew back. Cha then tested the drug on human blood vessel cells growing in Petri dishes, finding that the drug also inhibited their growth. Finally, she tested the drug on fibrosarcoma tumors in mice and found that it reduced blood vessel growth in the tumors as well as slowed the tumors’ growth. “We didn’t set out to find a vascular disrupting agent, but that’s where we ended up,” says John Wallingford, associate professor of developmental biology and Cha’s graduate advisor with Marcotte. The scientists’ goal is to now move the drug into clinical trials with humans and they are talking with clinical oncologists about next steps. “We hope the clinical trials will be easier because it is already approved by the FDA for human use,” Marcotte says. Funding for this research came from the Cancer Prevention Research Institute of Texas (CPRIT), the Welch Foundation, the National Institutes of Health, and the Howard Hughes Medical Institute.